I was born in Amarillo, Texas in 1949. 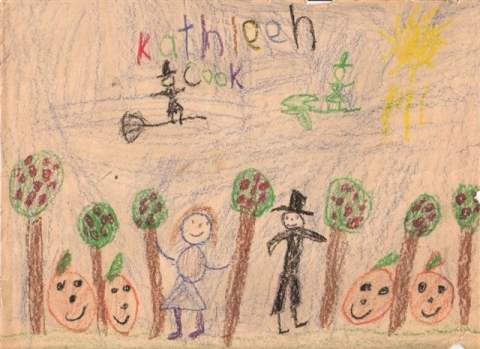 As a child, the art I made was not particularly exceptional, but there was a lot of it. I cannot remember a time when I was not drawing on every available surface. What was exceptional, I think, for a child, was an inner knowing and later, a fierce determination, that being an artist was all I wanted to be. In my family, this idea did not seem unusual, especially since my father, Lloyd Cook, was a professional advertising artist and painter, who from my child=s viewpoint led the glamorous life of getting to draw and paint all day long and get paid for it. Only later, in my own advertising art career as a fashion illustrator, would I come to understand the demands of the deadlines, the clients and the economic pressures my Dad had to confront and still be creative. Fortunately, at an impressionable age, all I saw was the fun and the seemingly endless art supplies. 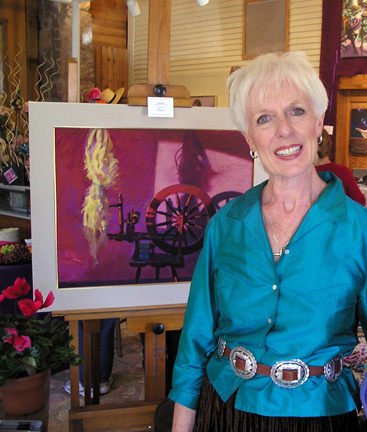 My earliest artistic influence and the person who introduced me to the beauty of pastel was Leona Turner, a professional artist in my father's circle, who was both a gifted portrait artist and a fashion illustrator for a local Amarillo fashion department store. As summer babysitter for her four young boys, my job was to keep the children out of her studio and occupied while she worked. Often, during naptime, she would let me practice with her pastels or let me watch her paint; sometimes she would give me a lesson in portraiture or illustration. Leona would even take me with her when she did portrait sketches at local events and would let me set up an easel next to her to practice. This incredible support for my very amateurish abilities was an enormous boost to my confidence and helped guide the art path I would later take as an adult. Other artistic influences, which later shaped the look and purpose of my own work, were primarily those of illustrators. 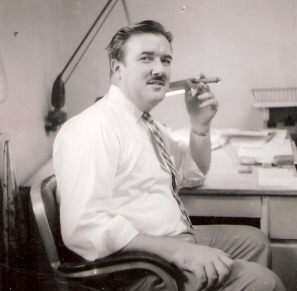 My father, Lloyd Cook, was a professional advertising artist and in those days, the 50's and 60's, there were no computers. Advertising artists had to possess an amazing array of actual skills from painting and drawing in all media to lettering, architectural perspective, photography, design, copywriting and printing methods. What I saw in his studio were mainly illustrations and resource materials that had to do with presenting a client=s product or idea in a realistic way. So, to me, as a child, the ability to draw or paint something accurately, as I saw my father and his friends do, was the defining characteristic and ultimate desire for an artist. I mark my commitment to art as a serious way of life and career, from the age of 18. My choices for education and career were always directed toward the visual arts as my resume explains. I attended and graduated from Amarillo Jr. College, where I got the basics in drawing and design and took Middle management courses to prepare for the career in advertising that I was beginning. Later, I attended Texas Tech University, in Lubbock, where my training included life drawing, painting, design, art history, color theory, printmaking, photography, architectural perspective, drafting and the other liberal arts courses that eventually led to my Bachelor of Fine Arts Degree. Also, during these years I took private painting lessons and made extra money doing portraits in malls, fairs, church bazaars and any place that would let me set up my easel and do quick sketches. I also did commissioned portraits of children to help finance my education. During my entire university career I had jobs in the in-house advertising departments of two well-respected retail fashion department stores in my college towns, White & Kirk and Hemphill-Wells. In these jobs, I was learning the real technical and creative aspects of illustration and advertising art. My work skills progressed from Agofer,@ to copywriter, to assistant illustrator and ultimately, after graduation, to head illustrator and advertising art director. For ten years, I had the incredible opportunity to draw and illustrate an enormous variety of clothing, shoes, jewelry, appliances, cosmetics, and everything the stores merchandised, all in the creative manner that these award-winning advertising departments expected. Understanding the drapery of garments and how to draw bodies, hands and faces in all manner of poses and how to work under the constant pressure of the deadline were all invaluable preparation for the shift in disciplines when I chose to end my advertising career and begin painting at the easel, full time. In 1981, a marriage and a move to the Texas Hill Country, allowed me to explore my own visual ideas instead of those of a client. It was exciting to discover that by painting every day, I was soon producing paintings that were being accepted into competition and my portrait commissions were increasing. 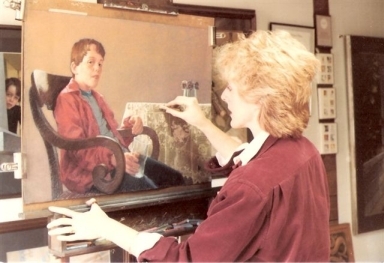 A major impact on the way I thought of myself as a professional artist came in 1982 when I was awarded coveted signature status by the prestigious Pastel Society of America (New York, NY) allowing me to use the PSA initials after my painting signature. The marriage did not last, but my commitment to being a studio painter did, with the added incentive of trying to make a living doing so. To supplement my income, I began teaching classes in pastel. This was not easy, as I was terrified of speaking to large groups. But, over time, I began to organize my thoughts, grew more confident in what I knew to share and used humor to relax me and the students. Teaching, which began as a way to make extra income, has now become something I love to do--- allowing me to start others on their own artistic journey, giving me great friendships and always helping me to refine and define what I believe and know about my own art. I have been an artist for a long time and have grown in my understanding of what this life path means. An artist needs two lifetimes, one just to acquire the skills of learning the language of artistic expression…the How’s. How to see color, how to draw & paint, how to use the supplies. The second lifetime, and most important-I think, is trying to discover what we are trying to say with these abilities. It is not enough, to just have dexterity with media—one must have something to say…the Why’s & What’s. Why am I interested in this subject, what do I want others to know, what are my feelings that I am trying to express. The Why’s & What’s are limitless and unique for each artist…and they change as we mature as people, as we experience the joys and sorrows of human life. Send an email to kathleen@kathleencook.com with questions or comments about this website. The copyright to all artwork on this website belongs to Kathleen Cook. Reproduction of the artwork on this website in any form is prohibited.